Promises Kept, Results Delivered- Please Vote Today! Home > News > Promises Kept, Results Delivered- Please Vote Today! I am grateful for the opportunity to serve the people of the 33rd District for the last four years. It has been a pleasure meeting people as my family and I have spent countless days talking to voters at their doorsteps, community, schools and businesses. Some are cheerful times like the County Fairs, others much more serious, such as meetings focused on battling the opioid crisis. Today, I'm meeting voters again at polling places across the 33rd District. After hearing your needs and concerns, I am pleased to remind folks that I have successfully passed legislation to address needs. I campaigned on reforming transportation funding so money is spent on the most cost-effective projects to improve safety and reduce congestion, and we've done that. My team's efforts have streamlined local law enforcement training, made it more safe for kids as they approach school buses, passed a law to improve access to life-saving naloxone, and spearheaded too many successful initiatives to mention. My office has successfully advocated for constituents to receive the service they deserve from state agencies, whether it's VDOT or the DMV, or many others. I've supported budget initiatives to increase pay for our teachers and State Police, increase local access to mental health and addiction treatment, help farmers, stop taxpayer-funded abortions, and much, much more, all without raising taxes. Last, but certainly not least, I've championed legislation that would help taxpayer's bottom line: education innovation and reforms to reduce demand for expensive new schools, reduce class sizes, and give better education opportunities to poor and special needs kids; the Frederick County legislative initiative to allow fair property taxation; and legislation to stop welfare fraud which has saved other states millions of dollars. 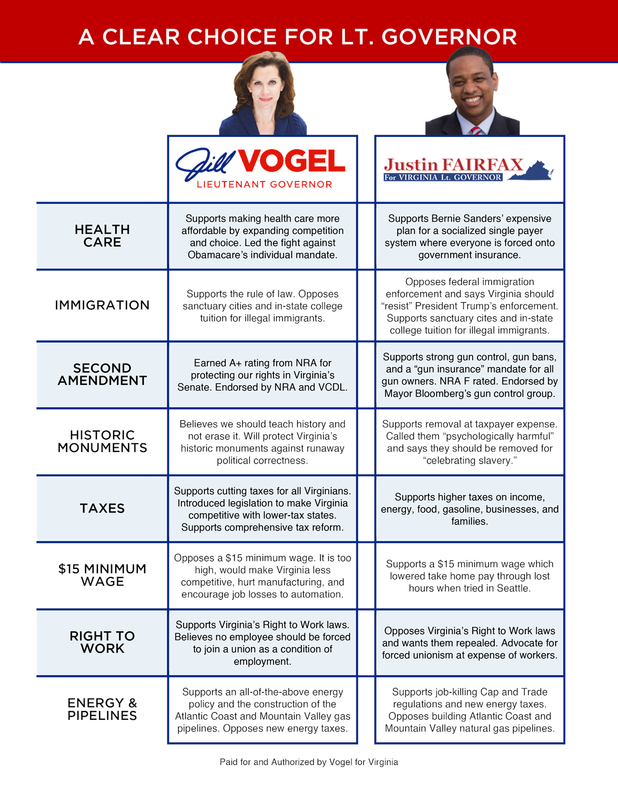 Some of the initiatives mentioned above were defeated by Governor McAuliffe and Lieutenant Governor Northam, so it is important to elect the Gillespie/Vogel/Adams team to help me get these bills across the finish line. Other bills, including legislation to protect unborn children from painful late-term abortions, slow down the school-to-prison pipeline, reduce drivers license suspensions, reform child support, and support parental rights for people with disabilities, were defeated in committees, but I will continue to work on these if re-elected. Thank you again for your support, and please vote for me and the rest of our Republican team before 7pm today! A helpful comparison of the candidates for Governor is available here. 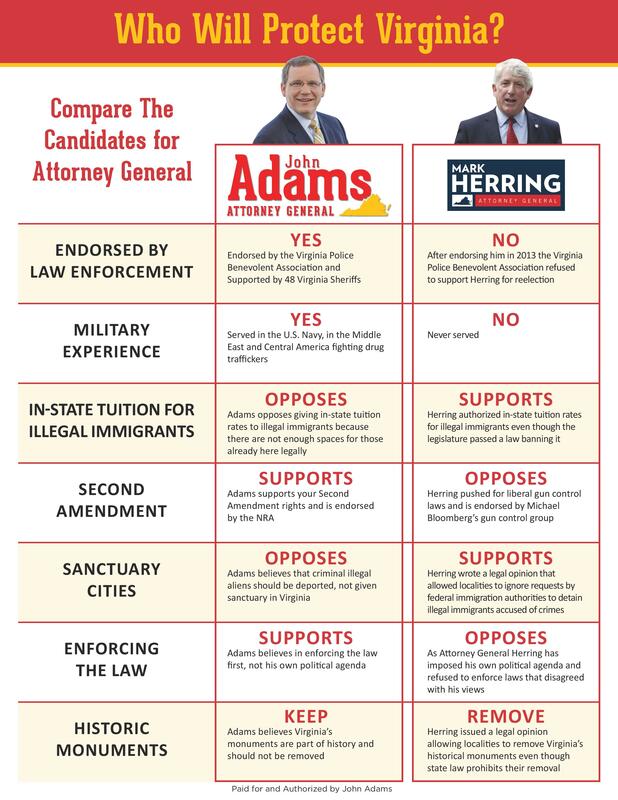 There are similar guides available for the Attorney General and Lieutenant Governor candidates, and for my opponent and me.